Yukitoshi Kataoka was a Japanese Army Sergeant who became a member of the 302nd Shinbu Special Attack Squadron in May 1945. A special attack (tokubetsu kōgeki or the shortened form tokkō in Japanese) signified an attack in which a pilot or crewman expected to lose his life. Kataoka began his training at one of the Pilot Training Schools established by the Ministry of Communications and Transportation. As we made many sacrifices, we devoted our time to difficult ultra-low altitude attack training. This literally was taiatari (body-crashing) tokko (special attack) training. In May 1945, our unit had already completed formation of Army special attack squadrons called Shinbu Squadrons. We advanced to Kodama Airfield in Saitama Prefecture. I was not able to tell anything to my mother and the rest of my family about becoming a special attack squadron member. On August 2, my 302nd Shinbu Squadron received the order to get ready to sortie. I had thought that I was resolved to die, but when that time came, a mixture of uneasiness, fear, and clinging to life came over me without my being able to do anything about it. However, that day's sortie was cancelled. I felt relieved, and at the same time my strength was sapped from my entire body. As we waited to sortie for nearly two weeks, this perhaps was the limit of a human's inner strength. Every day was a confrontation with death, whether today we would die or tomorrow we would be done for. Frankly speaking I was unable to stand it. Finally, living became painful, and I did not care that soon I would make my dive into a ship. It came to the point where I wanted to die once and for all. At times I thought that I was like a convict on death row. I think that my comrades also felt the same torment. On August 14, I sensed something unusual in the operations room. According to our information, a powerful enemy fleet was moving northward toward the mainland. The special attack squadrons were our 301st and 302nd Squadrons. It was determined that we would take off at 6 p.m. on August 15 and make our attacks. Against such a large force, we would not even have air cover, and there would be only 20 planes making special attacks. I was seized by a feeling of emptiness, and actually neither excitement nor strong emotions welled up inside me. I went out into a field behind our barracks and thought of my mother and younger sister at home as I looked at the moon through the tops of the pine trees. On August 15, from the morning the scorching sun was beating down. After breakfast, I visited Mr. Yoshikawa in Kodama Town who had taken care of me. I left my last letters and other articles with Mr. Yoshikawa, who ran a pharmacy. He said, "You will return alive," and gave me a senninbari (thousand-stitch belt) and a good-luck charm. At noon, the Emperor's message was broadcast. However, we could not understand it since the sound quality was poor. By connecting words that could be heard off and on, it seemed likely that the war had ended. When thinking "with this it will end without my dying," then the feeling that "this stupid attack will not stop to the bitter end" surged up inside me. When evening came, we headed toward our planes to make our sortie as scheduled. However, the spark plugs had been pulled out, sand had been packed into the cylinders, there were no propellers, and even the bombs had been taken away. Our special attack squadrons were waiting like this until the 17th. 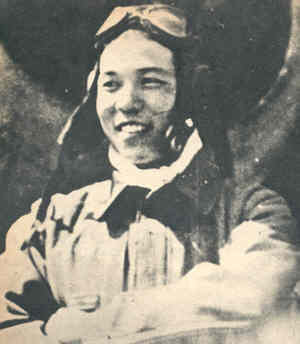 After noon, Colonel Imazu, Hikodan (Air Brigade) Commander, disbanded the 301st and 302nd Shinbu Squadrons more than three months after they had been formed. Our footsteps were heavy as we left for the barracks. We could not hold back our tears as we thought of comrades who gave their lives during training. Nobody said a word as we trudged along the dry gray path. Makino, Kikuo, ed. 1979. Ichioku nin no shōwa shi (Nihon no senshi 4): Tokubetsu kougekitai (Showa history of 100 million people (Japan's war history, Volume 4): Special Attack Corps). Tokyo: Mainichi Shinbunsha.